Hawker Joinery came to Winter Design in April 2016, asking for help to bring their brand into the 21st Century… By 5th June 2016 we’d succeeded in transitioning their entire brand image and identity – with a new logo, new brand guidelines, a new image library and of course, a beautiful new website. It seemed fitting to call upon an old, traditional typeface for the logo of an old, traditional brand. The typeface Baskerville, designed in 1757 by John Baskerville, is one of the most classical typefaces in the world, and its timelessness aligns perfectly with that of a traditional yet sophisticated brand identity. 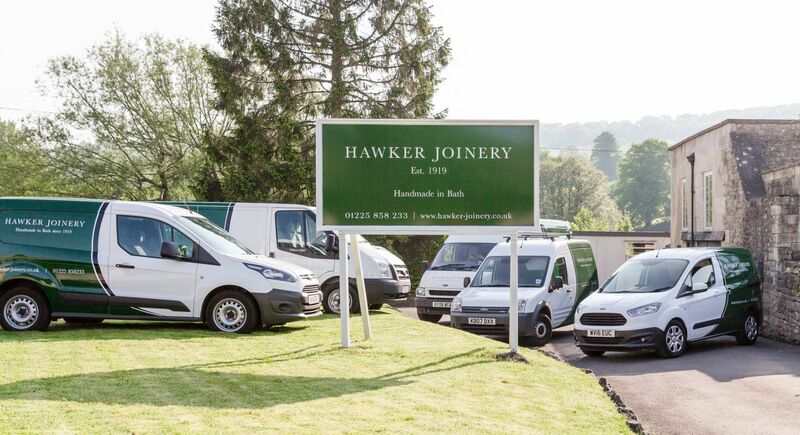 The new logo and brand identity has been applied to Hawker Joinery’s fleet of vehicles, signage, uniforms and corporate literature. The Baskerville typeface was cut in such a way that allowed certain letterforms to interact in harmonious ways. An example of this, as luck would have it, is between the H and the J, which allowed us to create a striking ‘condensed’ logo for sign-off and subtle application.